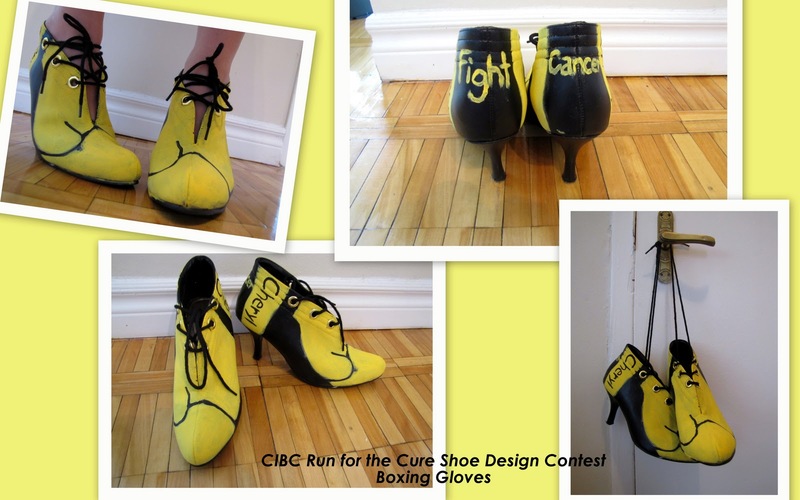 So, I just found out that I am one of the top 8 finalists for the CIBC Run for the Cure Shoe Design Contest! I would really appreciate any votes you can give me and if you could post this on your own personal blogs/websites. I will definitely return the favor whenever needed. My Design is #4, the yellow and black ‘boxing gloves’ to help fight cancer and to find a cure! “A boxer is someone who is tough, strong, brave, a fighter. I believe that everyone that has/had Cancer share the same traits. This is why I designed my shoes to represent boxing gloves. I did this contest in honour of my Aunt, who I lost to lung cancer. My Aunt, Cheryl was living out west and passed away when I was very little. Due to the distance between us and my age I feel we never got as close as we could have if she still still around. I only got to see her every summer, when she would fly down to visit. I do believe that she was a fighter and was very brave to stay as strong as she did during her illness. Remember shoe #4, and please post this on your FB, Twitter or anything, as the winner is determined by the amount of votes.